Do you want to add keyboard support in a Mashup? In this blog I’ll show how to get a keyboard key to invoke an event and how to user keyboard shortcuts to switch beteen tabs. I’ll talk about focus and how to user accelerator keys to jump to an input field and some other nice to know topics for Mashup and feature development. Pressing tab in a form will move the keyboard focus to the next control. In WPF there are two main concepts that pertain to focus: keyboard focus and logical focus. Keyboard focus refers to the element that receives keyboard input and logical focus refers to the element in a focus scope that has focus. There can be multiple elements that have logical focus in an application, but there may only be one element that has logical focus in a particular focus scope. You set a focus scope in XAML by using the FocusManager.IsFocusScope=”True”. First I want to change so that the detail area below the list is one focus scope and I want the focus to move from Name to your reference and then Save because that is most common. First I set FocusManager.IsFocusScope=”True” on the MIPanel and then I set KeyboardNavigation.TabNavigation=”Cycle”. Then I set TabIndex=”1″, then 2, 3. I leave the rest blank beucase I don’t need to set all nor do they have to be en absolute order. When the Mashup starts I want the focus to be in the search field. So I modify the start-up event on the List and set the Activate property. When it comes to buttons and you only have one save button you can set IsDefault=”true” on the button and it will be click upon enter. But in my example that would not work becuase I have the search button to consider as well. So I use the Activate property on the Startup Event on the list. I like Ctrl + S to invoke the save command. Since I want the keyboard shortcut to be available in the entire Mashup I add the key binding to the top Grid. As it requires a modifier and not a single Key I need to set Gesture=”CTRL+S” and not the Key. There is another potential issue with adding this Save command. All bindings in the Detail area are two-way bindings that will be updated once the Keyboard focus leaves the input button. 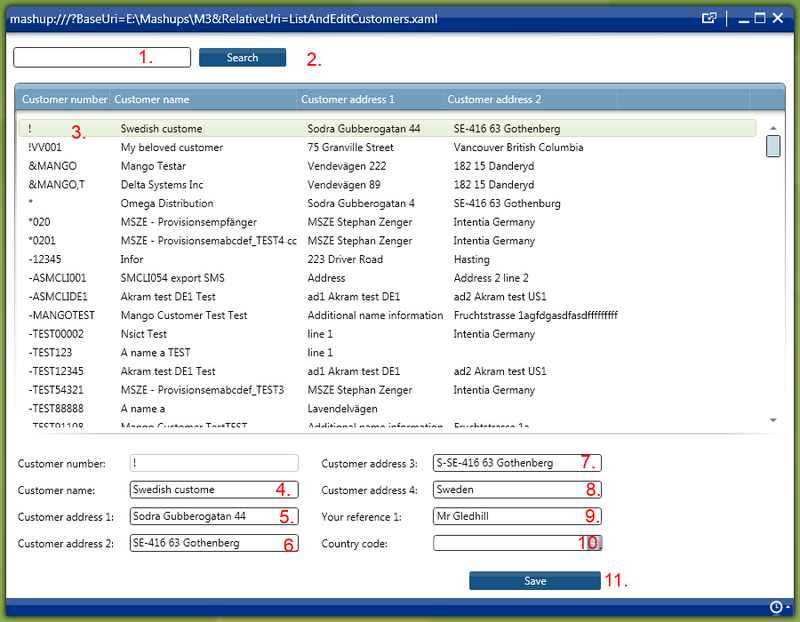 That means that if I change the Customer name and press Ctrl+S before tabbing to another textbox the value in the data behind the control is not changed yet. So when you introduce a shortcut key to save a form that you can edit you need to change the default behaviour of the UpdateSourceTrigger for the binding in the TextBox. The default value for most dependency properties is PropertyChanged, while the Text property has a default value of LostFocus. So I have to set the UpdateSourceTrigger to Property changed on all TextBoxes. To improve keyboard support we can add the use of mnemonics. Mnemonics is the ability to navigate to a control using a key stroke combination. Access keys allow you to hit Alt + SomeKey to quickly interact with a control in the UI, such as hitting Alt + O to click an “OK” button. Labels supports access keys. You can associate a Label with another control, such as a TextBox, ComboBox, and allow the user to type an access key defined by the Label to set focus to the other control. You define the access key by writing _ in the text. Pressing down Alt will display all access keys in the UI. I’ll change the Customer name to Customer _name and _Your reference. Then I have to set Target on the label to my TextBox. Here is the final result after all modifications. For an example of Tab navigation and more stuff you can do check out the Tab Control (Common Examples) under the Help menu in the Mashup Designer. I have Jscript call mashup. From the mashup the user can write value on specific text field then he presses a button (as Copy value button), then the value returned to Jscript. I did it, but I need to press a key like “F5” to act like the button. how to bind key (like F5 ) to button click? You do that with a keybinding but the question is – what panel is the button on? You do keybindings to a command so what is the command you would like to do on the click? You don’t think of it as F5 executing the click you think of it as mapped to the same command/action as the click. I have added event listener for button on JScript code that call the mashup. so when user press the button, a method in JScript invoked. but i didn’t know how to add event listener if key pressed. So i have two ways, first bind key to button click, second add key listener for key “F5” on JScript. but i don’t know how to code any of them. I’m not sure if you can write a command in jscript. I think the approach you can try is to add an event handler on the form for F5. The event is keydown and you add it to the panel or the entire window. https://msdn.microsoft.com/en-us/library/system.windows.uielement.keydown(v=vs.110).aspx. Would it be enough to handle F5 in the M3 panel or would you like to handle it in the entire Mashup? Also there might be an issue with adding keyhandlers as M3 has it’s own keyhandler and F5 is a valid key for some programs. I might be able to do an example but not until next week. 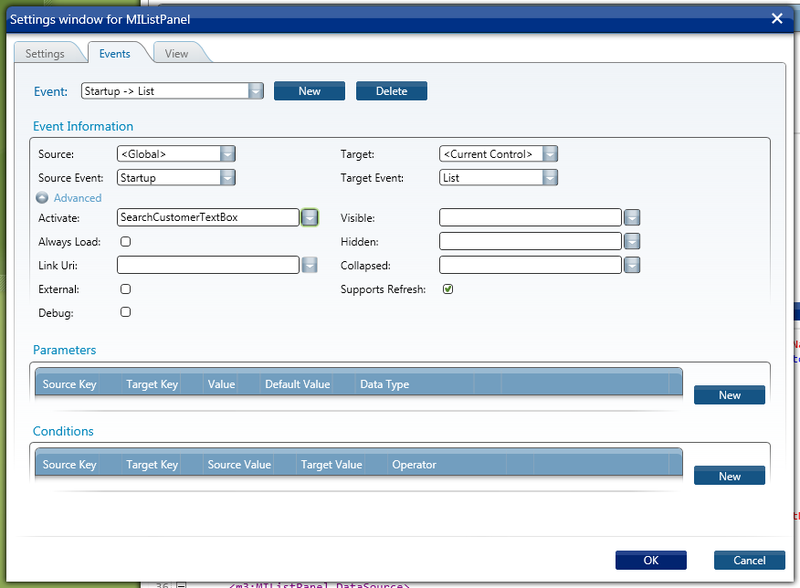 Is there a way to use the Acces Keys when using MVXCON constants? The accelerator key should still work even if you have a binding or extension – but the text must have an _ (underscore) – before the accelerator key. Standard constants don’t have that. But you can translate and use accelerator-key. It takes som serious design work to decide those keys for a screen – in all languages. Did you see my reply above? If you re-use exisiting MVXCON then the answer is no. If you create your own constants then yes – but you should consider using the translation capabilities within the Mashup framework – so you can decide where to put the underscore to get the accelerator key.